Universal Studios Florida’s Diagon Alley is a must-see spot for kids ages 2 to 92 when visiting Universal Orlando Resort. Most people know it as the place to practice their Harry Potter spells using an interactive wand all while drinking Butterbeer. Others love to get their thrill on by riding Harry Potter and the Escape from Gringotts. And one of the most popular attractions? Watching the dragon breathe fire with temperatures reaching up to 3,560°F. But these popular attractions are just the beginning of what you can experience. While waiting for my kids to ride and re-ride Harry Potter and the Escape from Gringotts, I quickly found hidden gems on signs, in window displays, and even inside the stores. 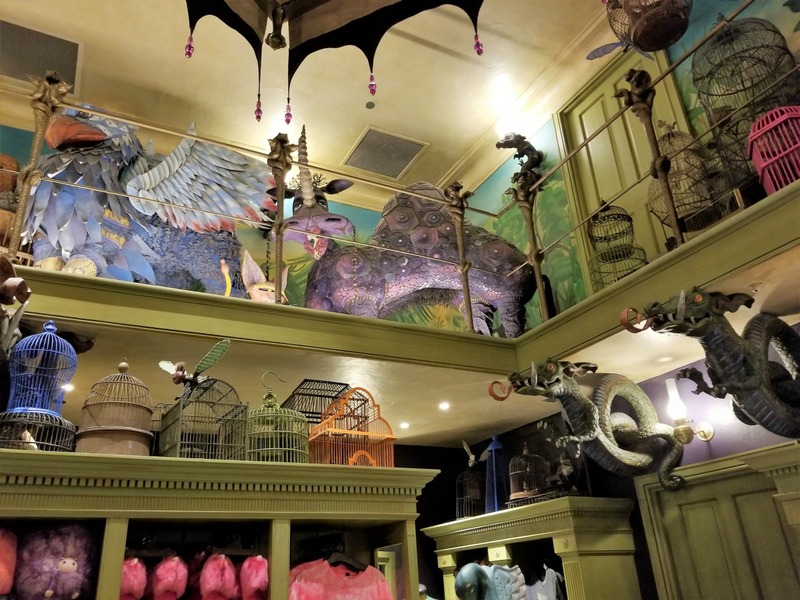 Check out these 11 secret spots to discover Harry Potter spells and other fun finds in Universal Studios Florida’s Diagon Alley. 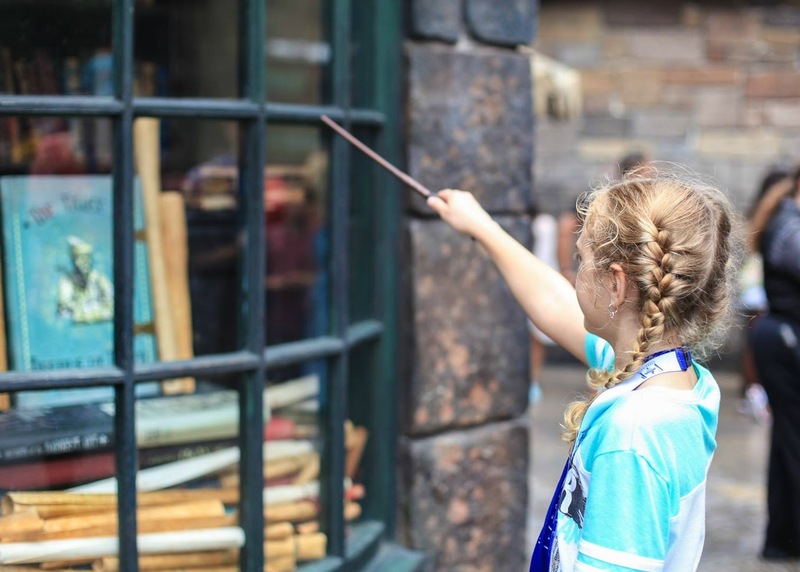 No visit to Diagon Alley is complete without an interactive wand. 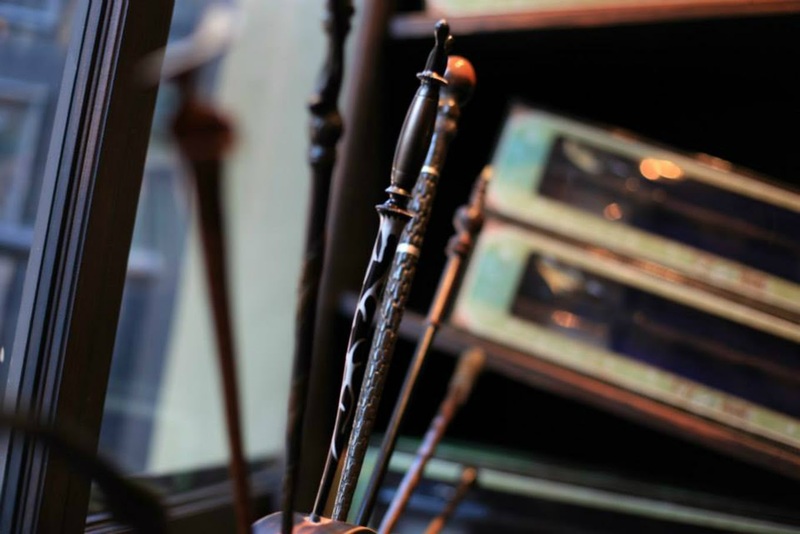 So, if you haven’t bought one prior to entering this magical spot, head over to Ollivander’s where you’ll have your selection of many wands. 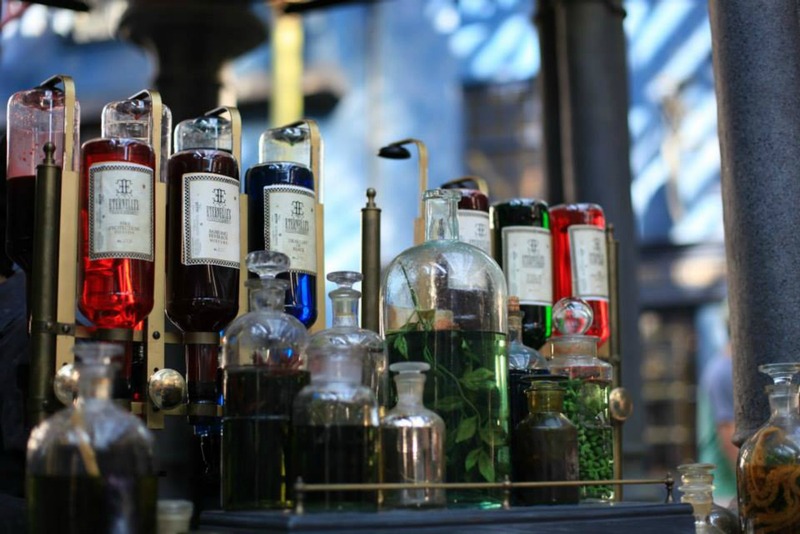 From there, you are all set to head to one of the many spots to cast your Harry Potter spells. My son and I always go straight to the interactive wand spot in Knockturn Alley that makes the digital skeleton move (there is always a line for this one). 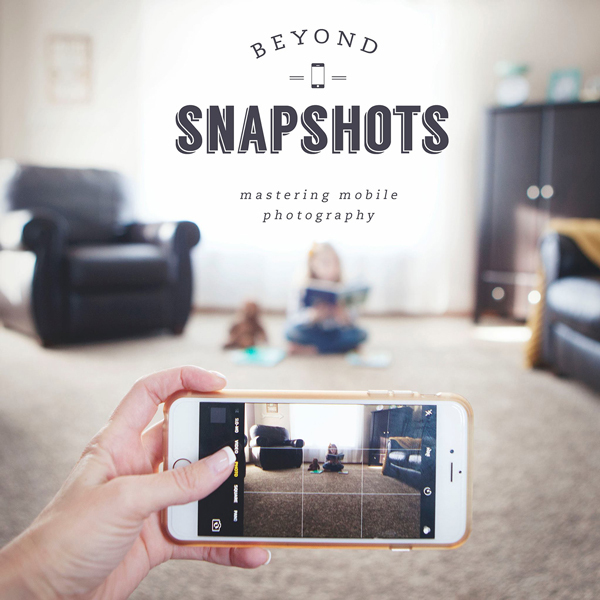 Searching for these spots as a family is a great way to make magical memories. To find all of the locations, look for markings in the pavement, indicating where you should stand to cast Harry Potter spells. When you find one, stand on the exact spot and use simple movements for the best chance of having the spell work. If you need help, Universal Orlando Resort team members are available to assist you. Not wanting to search on your own to find all the spots to use your interactive wand? Look no further than in your wand’s box for a map. One side shows the spots in Diagon Alley and the other side shares those in Hogsmeade. Tip! If your spell isn’t working and you see an anti-jinx sign near the pavement marking or if a team member tells you it’s jinxed, this means the spell isn’t working. While making the giant skeleton move is a huge crowd pleaser, don’t miss checking our the tattoo parlor right across the alley. In true Harry Potter fashion, the shop advertises not just static, but motion tattoos. You can stare into the parlor and see your options for tattoos and they actually move. My family, of course, made terrible jokes while we looked at the parlor for example “I want to get a full-body tattoo of myself only skinnier.” Or “Can I get a tattoo of my muscle flexing bigger?” No one can actually go under the needle here, so don’t start planning your soaring Hippogriff back mural. The good news? You can enjoy window shopping. I mentioned the digital skeleton that you can make dance about while casting a Harry Potter spell with your interactive wand in Knockturn Alley. But, have you ever noticed the troll skeleton just behind the dancing bones? It’s one of those things you might face palm yourself for not seeing because it’s huge. I’ve been in there a dozen times and I never noticed the giant of anatomy hanging in the shop window. Be sure to check it out on your next visit. My favorite little detail in Knockturn Alley is a window filled with newspaper. The paper is filled with articles and information from the Wizarding World of Harry Potter. The advertisement for a Gringott’s position had me smiling and laughing. Who comes up with this stuff? Did J.K. Rowling suggest this or do the Universal Orlando Resort creative teams come up with these ideas? Either way, make sure to search the want ads for jobs and “Snake oils” to solve your wizarding ailments. While at the Magical Menagerie store, make sure to chat with a sales clerk. The gal I talked to shared all sorts of interesting information. First off, she named all the creatures in the shop like they were friends. For example, I discovered a Crumple-Horned Snorkack, Luna Lovegood’s favorite creature. The clerk told me that the Snorkack is an animal that Trolls are stupid enough to try and ride even though the horn often skewers them. Specifically, she said, “What can you expect? Trolls are very dimwitted.”She also told potions I could use and what books I can find the potions. The information you can gain at the Staff of Shops is by far more useful than just locating the stuffed pygmy puff. On the other side of the street from the Magical Menagerie is one of the first signs I admired: “Obscurus Books.” What’s that? The publisher that commissioned Newton Scamandar to write “Fantastic Beasts and Where to Find Them.” Of note to theme park fanatics, this sign was up in Universal’s Diagon Alley before the movie came out for us muggles. Pretty clever work by Universal Orlando Resort’s creative team, right? The Leaky Cauldron will satisfy your not only your Butterbeer needs but also your British Food desires (Scotch Egg anyone?). You can look at all the one-of-kind drawings on the walls while you slowly sip the best drink in Diagon Alley. But don’t leave without checking out the real Leaky Cauldron or reading the instructions immediately to the right of the exit door. Makes me ask, which way are you gonna leave? I have to give credit to my daughter who found the Gildaroy Lockhart—the heartthrob of Ms. Weasley and just about every mom in the Wizarding World of Harry Potter—on display in the windows on the main thoroughfare. Check out the titles as you peruse. What my daughter didn’t notice was what kinds of books are ripped up and put at the bottom of the display immediately next to it. It’s a law text book and not from Orlando. Give it a look when you are wondering the street. While you are on the main thoroughfare, notice the two competing apothecary shops immediately next to each other. Both the windows have several odd and rune labeled bottles of potion necessities. My business goes to Mulpepper’s because their bottle logo is better and who can’t be impressed when you see “worm mucus” in a jar. I didn’t’ even know worms had noses to wipe, but I guess Mulpepper finds a way to harvest it. Usually worm mucus just thickens potions but if you wanted to make Wiggenweld Potion, then you have a key ingredient. As a mom who has driven a minivan for many years, I felt a kinship with the Family Broomstick sign atop the Diagon Alley exit. I never considered that a witch might need more than a Harry Potter spell to haul several kiddos without broomstick skills to various places throughout town. Thankfully, there is a 6-passenger broomstick. I wonder how many cupholders it has! The only place you will find a British electrical outlet in the US is in Diagon Alley’s Museum of Muggle Curiosities. A little piece of British day-to-day life is right in the wall. Don’t leave the museum without checking out the other curious things that interest the Mr. Weasley’s of the world. Lamps, old typewriters, and fans. And, if you look down the same street you will probably see a House Elf-Placement business. Now that’s funny! House elves needing a new house? 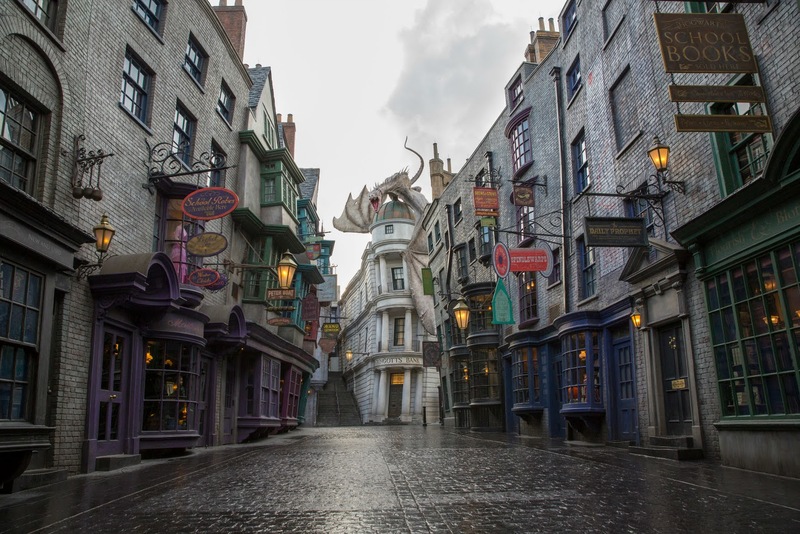 Visiting Diagon Alley at Universal Studios Florida is a must-do activity. While there, you won’t want to miss casting Harry Potter spells with your interactive wands, escaping from Gringotts, getting a Butterbeer mustache, and warming up as the dragon breathes its fire. 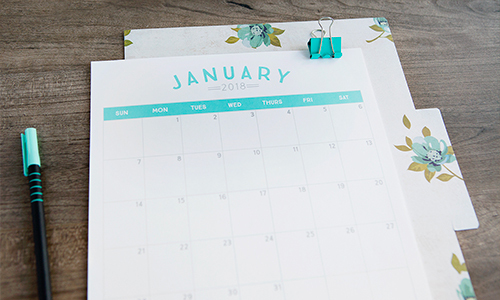 But make sure to leave time to check out the amazing details, not just in the design but also in these 10 not-to-miss secret stops along the way. And if you want to find an 11th one? I hear there is some instant darkness powder in Weasleys’ Wizard Weezes. Let me know if you find it. Have you been to Diagon Alley? If so, what was your favorite find? 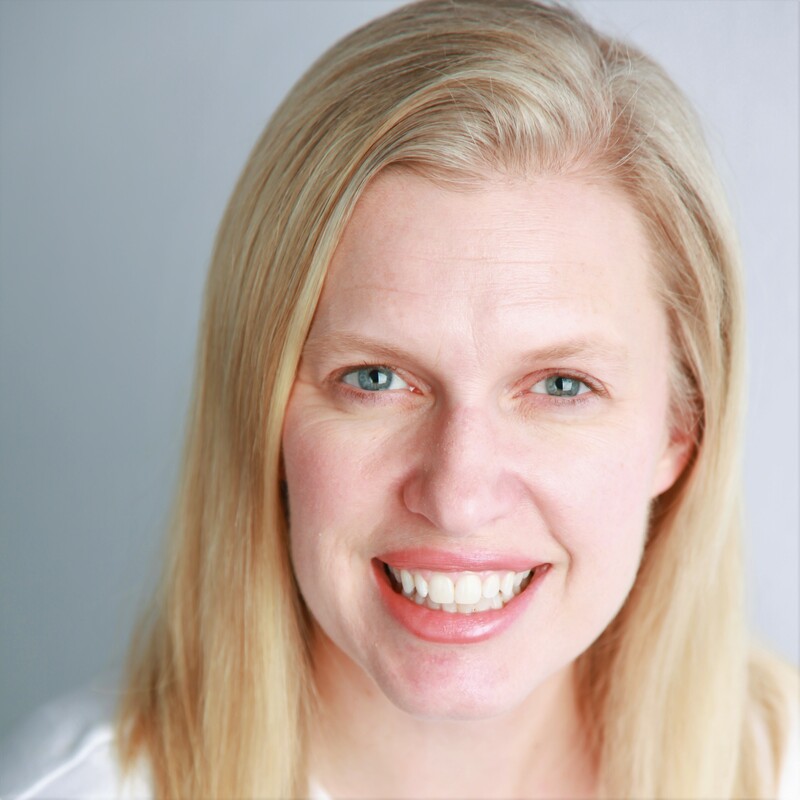 Annette Barney is a wife and mother from Salt Lake City, Utah. As the OrigamiFoodie for FaveMom.com, she shares her love of paper and the stuff put on plates. She works for a local charter school board and has been involved with education for almost 2 decades. 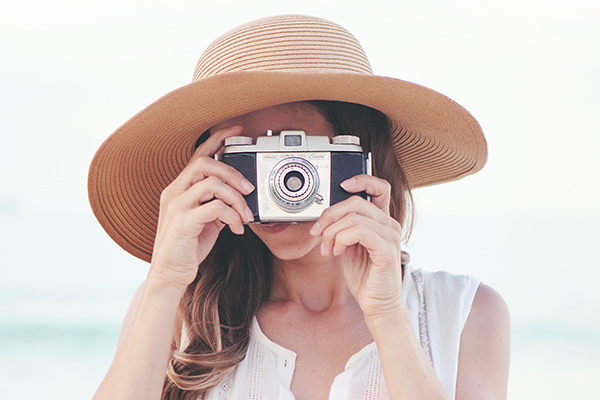 When not traveling with her family, she can be found volunteering for her local church, skiing cross-country style, running a trail or reading too many romance novels. Ahhhh! I love that fire-breathing dragon! Worm mucus, worms wiping their noses, haha. I love Universal and the Harry Potter sections are my favorite. I love the food at the Leaky Cauldron, the Toad In the Hole is the best! 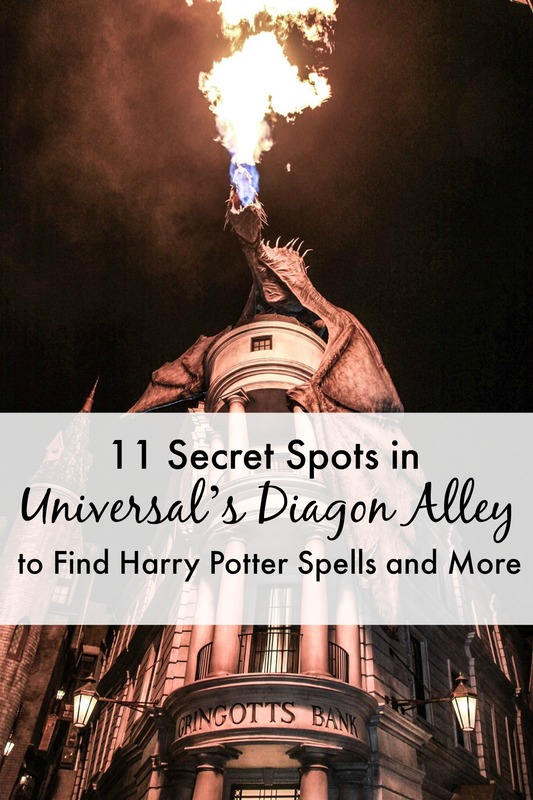 Thanks for sharing all these cool, little known secrets to Diagon Alley.